Our creative AESS work has continued throughout 2015 at two more innovative projects, both located on the burgeoning Upper West Side in New York City. These are the Hudson Yards multi-use development and the 635 W.57th Street high-rise. At the former, we are making finely-finished mullions for its first phase; while the latter requires unique “twisted” frames to accommodate its pyramidal exterior look. Both jobs have very demanding tolerances to make the requisite “fit” to promote the signature exterior appearance. BIG or SMALL, we do it all. Yes, we can fill all your fabrication needs, even if today’s need is a small one. We fill these orders promptly; then we are ready to fill your extended orders that require periodic deliveries for month after month, at scheduled intervals. In either event, strict compliance with specs, careful & timely production and service as you require are what we do in every instance. 1. Though most of you are by now familiar with this term, AESS is the acronym for Architecturally Exposed Structural Steel----a catch-all phrase for any (large or small) finely-finished steel members (prepped, welded, filled, blasted, polished, and/or uniquely painted/finished) to be permanently open to the view and touch of all after the job is done. AESS work is never covered by sheetrock or otherwise hidden from public view. Our COO, Jim Murray, has been an integral part of many early AESS projects, such as the BWI International Airport [Now BWI Thurgood Marshall Airport] (erected almost two decades ago and serving the Washington, DC/Baltimore area). There you can see the structural steel ceiling space frame with its threads, pipes and connections in plain view-------- and still shining like its original fabricated & installed condition! Since then, Jim has overseen many AESS jobs. WE HAVE THE CAPACITY TO DO IT ALL! HIRE US; YOU'LL SEE; YOU'LL BE PLEASED. Metfab Metals products and services are always in full compliance with ALL your specs. Hudson Yards, NYC, NY ----- We have worked on this huge West Side development throughout 2015; much of our work has already been installed, especially in “Block C’. We have made the same type of huge AESS mullions as we delivered to WTC4, a few years back. Right now, we are doing other needed fabrications for the various other buildings making up the current structures rising there. NOW, Metfab Metals is your single best fabrication answer, not only for quality custom and production Heavy-Gauge AND Light-Gauge metal parts, but also when your job requires AESS in all its MANY forms, finishes and applications! We always offer to work --- FOR FREE --- with our customers at the project concept stage to anticipate issues before fabrication, to suggest better ways to order, extrude, cut, drill, paint, finish, even stage and deliver and always to save time and money. You may find it more surprising to learn of the scope of use of UAV’s in a broad spectrum of businesses. Many of these impact the projects we work on every day. One of the easiest applications to envision is the inspection of the superstructure of a bridge over tidal waters such as the Golden Gate Bridge in San Francisco, CA or the George Washington Bridge in NYC, NY. The “eyes” of the UAV (actually high resolution cameras) can inspect areas that workmen can’t easily or cost-effectively access. 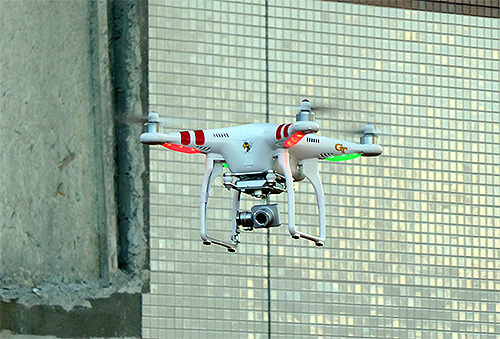 UAV’s or construction “drones” have so much potential value to the construction industry itself that they are even spawning new business ideas/entities, such as UAV rentals or even 24/7 aerial security “eyes” to remotely patrol the site while all personnel are home. [As the cost of a UAV/camera linked to the office monitor is relatively modest, this could have real impact on even smaller sites/jobs, not just the mega-project.] We here at Metfab Metals have studied this as some customers have already integrated UAV’s into aspects of their operations; more is sure to follow. These “flying robots” can “talk” to the office computer (and even the AutoCAD program) so that the aerial pictures delivered can update site conditions/progress and make adjustments seamlessly. The result could be 3-D models becoming everyday events. The cost of the technology is far less than the cost of delay/design error. 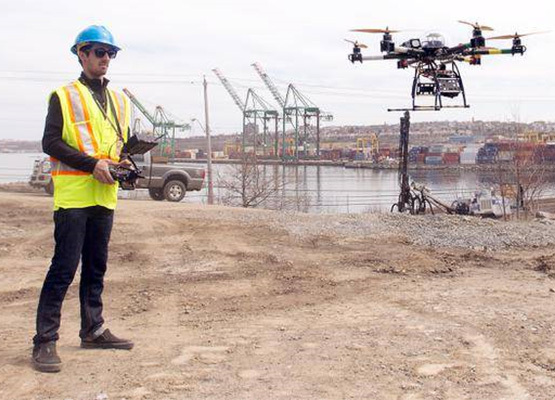 UAV’s, in turn, can record inadvertent site hazards in order to improve overall project safety (consequently reducing ultimate insurance costs/claims)so that fewer jobs are delayed or run over budget. Another unexpected consequence can be NEW business. This can arise from UAV’s equipped with thermal monitors making recordings of heat losses from adjacent properties so that a projected need for retro-fitting can be developed and presented. All this segues into university professors theorizing about a “fleet” of UAV’s one day operating in tandem, per a computer-driven algorithm, to deliver precise payloads of construction materials to precise settings that would “build” the structure without human intervention. While this seems still quite futuristic, it’s suggested that this would be particularly helpful on narrow urban sites with limited access and/or storage. In short, we can be confident we’ll see yet-unanticipated innovations in the coming years due to the flexibility of these UAV’s and the data they develop and illustrate. What do we draw from this worthy new aerial tool? Simply----while Metfab Metals does not install at the jobsite (our customers most often do) we are well-informed and fully prepared to handle what our customers’ UAS/UAV’s expanding information flow can give us. We already have in place the technology---and informed staff---and already upgraded our computer resources. Whatever your UAVs can record we can receive, digest, review and use to make prompt adjustment to our parts to better make today’s site installation smoother, avoiding the discovery of glitches after shipment ---and so much more. Call us; you'll soon see what we have written here is what we can really do for you. Note to our readers: Watch for future updates. [If we don’t have your company’s current list of project managers, as well as others, send it to us.] We can’t send you these informative posts, if we don’t have ALL your contact information---and that of ALL your project managers. 1. See, for example, FAA report of “near misses”. www.allgov.com/news/controversies. 3. “UAV” is the accepted acronym for an “unmanned aerial vehicle”; “UAS” is used interchangeably with UAV and means “unmanned aerial system”. Perhaps the single hardest part of our job is GETTING to do your fabrication work in the first place. [I know, I know----we all have that same issue.] In a way, that’s a substantial part of the reason for these Newsletters. But there are other reasons. A good reason to issue these is to keep our customers more up to date on industry matters, as well as Metfab Metals matters. Well, we read other industry journals to keep our staff---and you also---informed of new industry trends and developments. Recently, we reviewed a well-documented economic projection from the respected GILBANE Building Company, titled as “Construction Economics, Market Conditions in Construction, Summer 2015”. Citing myriad sources ranging from AIA to the Bureau of Labor Statistics to www.metalprices.com the consensus is rosy for real growth in our industry. Construction spending is increasing at the fastest rate of growth since 2004-2005. The outlook is very encouraging. Construction spending will grow 10%+ for 2015 and 8%+ in 2016. Actually, one of the few negatives mentioned is our industry’s lagging ability to find enough skilled workers for this now-computer-controlled industry. We do NOT lag in this regard! What do we draw from this worthy study? Simply---- Metfab Metals is well-positioned to handle our customers’ growing needs. 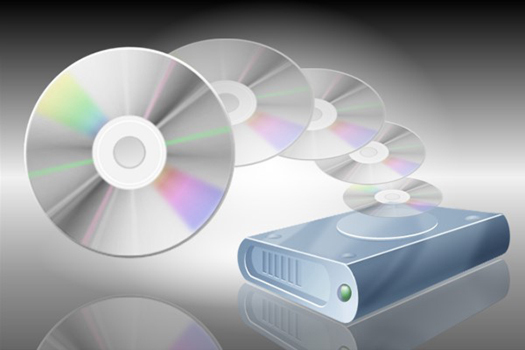 We have already expanded our shop resources; our staff is well-trained for all your needs; we have already upgraded our computer resources; we have expanded our production capacity ---and so much more. Note to our readers: Watch for future updates after our Newsletters in direct emails to you and your project managers. [If we don’t have your company’s current list of project managers, as well as others, send it to us.] We can’t send you these informative posts, if we don’t have ALL your contact information---and that of ALL your project managers. Hudson Yards, NYC, NY ----- -Our work here continues. 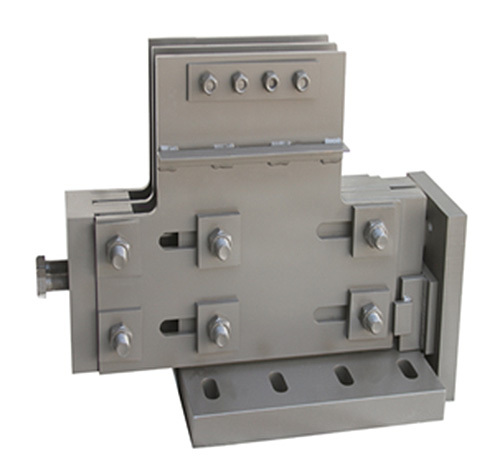 We have already delivered truckloads of AESS, as well as other fabricated metal. This job is several square blocks of prime Manhattan real estate being developed to supply a true mix of commercial & residential uses. See its website at www.hudsonyardsnewyork.com. In these Newsletters, we often remind you of both what we are doing in our shops AND what our shops can do for you. [Of course, our full website---presently undergoing some updating---can give you a far fuller picture.] We understand too that you’re busy doing major jobs as a consequence of your own HARD WORK! We just ask you to call us when you have any open metal issue or even need parts quick. 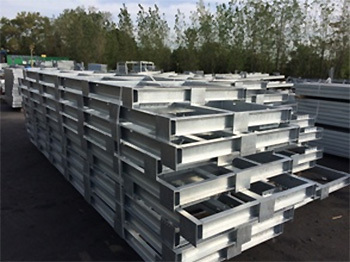 Last month we explained that no one knows how to do every phase of the construction of a major project; indeed few know all the processes or steps that go into even just the steel fabrication required for completion of a major project. We even pointed out that we often outsource contracted processes, better done by others--------our talented sub-contractors. As we have a hard-working staff, led by our C.O.O. and founder, Jim Murray, that literally has hundreds of years of combined steel knowledge and business acumen, we can solve most of your steel challenges quickly and right here, in-house. If you’re up against a schedule glitch, a needed “rush”, a drawing revision, a delivery screw-up--------or you just have a steel issue you can’t resolve-----CALL US! Let me repeat again some truisms in the real world of steel construction today. So, when you hire Metfab Metals, you get more than the resources listed on our website. You get the combined skills, experience and real-world know-how of many experts----even the guys that complete the early fab drawings for you, as you often need those done. Call me and discuss some of the 21st century jobs we are doing right now and how we can “do it all” to deliver your needs as ordered and spec’d. We still have yet more capacity and all the skills and capabilities to help you on your jobs. Try us; call us; email us. We’re waiting to hear from you. YOU WILL AGAIN SEE WE HAVE THE CAPACITY TO DO ALL YOU NEED. 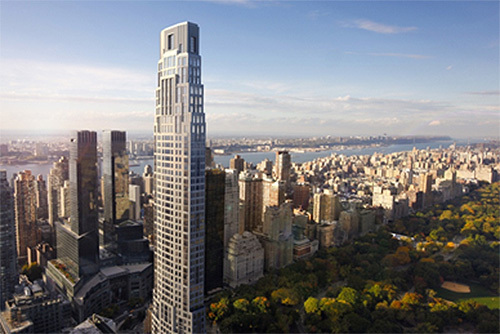 220 Central Park South High-Rise, NYC, NY ----- -We are now finishing the first phase of frames for stone setting. As our frames are installed, we will seamlessly move on to supply our customer’s further needs as this retro facade rises over Central Park. DON”T FORGET: We always offer to work---FOR FREE---with our customers at the project concept stage to anticipate issues before fabrication, to suggest better ways to order, extrude, cut, drill, paint, finish, even stage and deliver and always to save time and money. 1. National Museum of African American History & Culture in Washington, D.C..
2. See our August, 2015 Newsletter stored on our website. 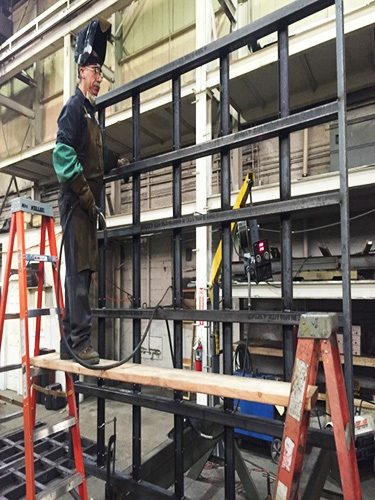 In our Newsletters, we often offer truly practical advice and information for your jobs-----directly from our steel fabrication experience. Today, we will digress a bit BEFORE we repeat new advice/info in that vein. Let me tell you how this applies in your favor as our customers. 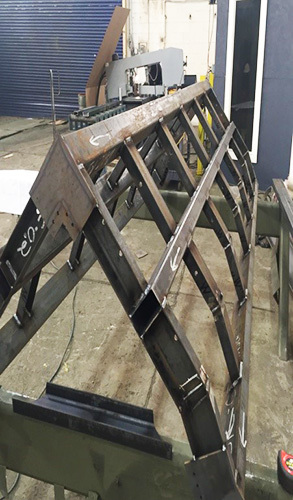 No one knows how to do every phase of the construction of a major project; indeed few know all the processes or steps that go into even just the steel fabrication required for completion of a major project. As we like to believe we are “wise” (at least as to fabricating steel), we know how “to handle (any) uncertainty, and (any) limitation.” It really only takes two (2) simple, but essential, steps: (1) thirty plus (30+) years of steel experience; (2) limitless outsources for processes better done by others in the person of our talented sub-contractors. To make this even more concrete, we now have assembled a staff, led by our C.O.O. and founder, Jim Murray that literally has hundreds of years of combined steel knowledge and business acumen, such that they can solve most of your steel challenges (e.g., schedule, rushes, alternatives, delivery, etc…) right here, in-house. But where we regularly exercise some true “wisdom” (simply based on our years of experience) is in the second step. Y’see, we never hesitate to review your job specs and line up from the getgo true specialists in phases better done by others (of course, under our contract, supervision and project management per our pre-production agreement with you and your specs). Let me give you a few examples. Finishing steel today is not just “slapping on some Valspar”; job specs regularly spend pages defining the required VOC, finish, steel prep, application steps, etc for this. We have the “wisdom” to sub such specialties out to experienced subs who ONLY paint/finish. This is exactly what we just successfully did for the above NMAAHC classic. Of course, we truck your parts there and bring them back in 1st class condition. This is one of the learned skills we have from earlier challenges. A second defining example might be in the cutting of the steel itself. Will we saw it, water-jet it, plasma-cut it or whatever? We now have sources that frankly can do this faster and more finely than we might. So we truck it all back & forth to these experts too. I could recite more examples, but these should make the point well. So, when you hire Metfab Metals, you get more than the resources listed on our website. You get the combined skills, experience and real-world know-how of many experts----even the guys that complete the early fab drawings for you. This month we are jumping into some truly 21st century jobs in which we will marshal all the above options to deliver the parts as ordered and spec’d. But we still have yet more capacity to help you on your jobs. Try us; call us; email us. We’re waiting to hear from you. We have either made or supplied so many items, at one time or another, that some of our regular customers have remarked: “I know you don’t make this, but can you point me in the right direction to obtain it.” By the way, we often make the needed item, no longer surprising our inquirers. So don’t waste your time when we can “take it off your plate”. 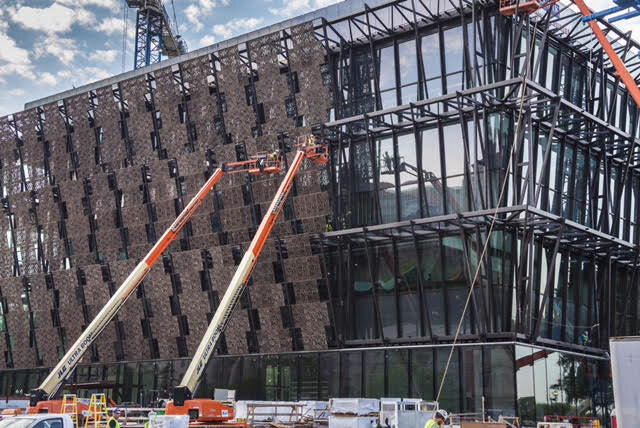 National Museum of African American History & Culture, Wash., DC (“NMAAHC”) -----Our contract is now 100% done, delivered & erected at this magnificent building. 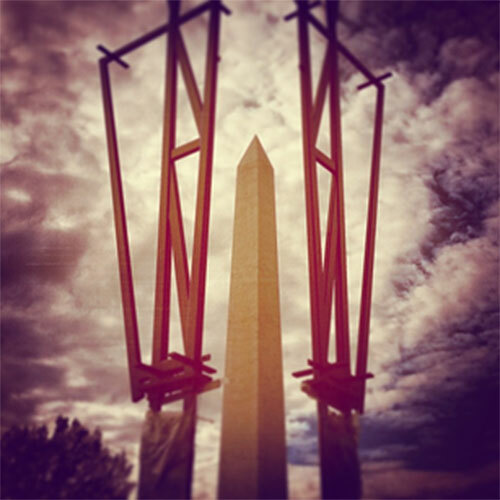 We worked “hand in glove” with the erection group to get this new Washington, D.C.icon moved along to completion soon. Hudson Yards, NYC, NY ----We have now made finely-finished AESS mullions for the first phase of this job that is more than one square block of multi-use buildings. Follow this work not only on our website, but on the project’s website itself at www.hudsonyardsnewyork.com. 625 57th Street high-rise -----We have now finished the unique “twisted” frames needed for this pyramidal exterior. Our frames are now installed for this complex design. And we move on to supply whatever else our customer needs here. 1. 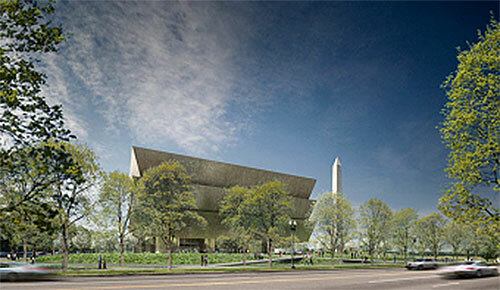 NMAAHC is the acronym for almost-finished new Smithsonian museum in Washington, DC. The full name of the museum is National Museum of African American History & Culture. 2. The Road to Character, David Brooks, Random House, New York (2015) at page 9. In our Newsletters, as in the making of our state & country’s individual laws, it is wisest to keep to just one subject (or topic) in each. But this month we cannot follow this prudent rule. Let us tell you why. Let me again be direct and state it shortly------if you have a question (any question) AND it relates to steel, CALL ME----whether you think we can make it------or even whether we can get a particular steel or related item you need. With these new able & experienced hands, we look forward to even better servicing YOU---our customers. Come visit us and meet our new colleagues. You can see our updated facilities too. Mark has over 30 years of purchasing experience, at various major companies, cutting a wide swath of industries. He can help you to sell us what we need in every aspect of our business. Call Mark today. 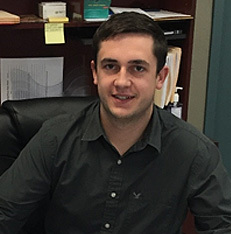 Ryan is a young engineer with a degree in Mechanical Engineering from Stevens Institute of Technology. Earlier he worked for us as a student-intern. He’s pleasantly surprising us with all he’s learned so far and how much he’s helped us already. 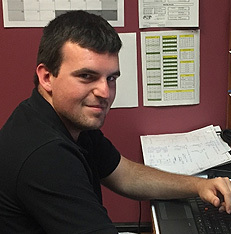 Dean is finishing his engineering degree, also at Stevens, as an honors student while now working full-time for us. 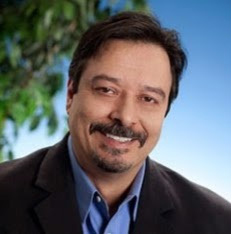 We are happy to have him and his superior knowledge of SolidWorks, AutoCAD, and so much more. With these tools, he’s doing in-house lots of 2-D & 3-D parts & assembly’s drawings as well as production spreadsheets, saving us from unwitting shop errors. Despite his youth, he has already had a number of hands-on years in his family’s fabrication business. With all of us working together, we have the capacity to do it all for you! Hire us; we can better manage your needs than even before. National Museum of African American History & Culture, Wash., DC (“NMAAHC”) -----100% of our work done, delivered & erected at this magnificent building. We got past lots of “speed bumps “here, imposed strict Project Management, created unique strict-tolerance AESS integrated frames, & worked “hand in glove” with the erection group to get this new D.C.tourist-magnet moved toward final completion. Hudson Yards, NYC, NY ----- this is going to supply us with challenging fabrication issues for the next few years! Not only is AESS work needed here, but other mundane parts such as anchors, clips, lintels, etc… We are first making finely-finished mullions for its first phase. You can follow this work not only on our website, but on the project’s website at www.hudsonyardsnewyork.com. .We always offer to work --- FOR FREE --- with our customers at the project concept stage to anticipate issues before fabrication; to suggest better ways to order, extrude, cut, drill, paint, finish, even stage and deliver and; always to save you time and money. Call me. Come in and talk about your pre-construction fabrication concerns. As CBS’s Scott Pelley intoned on a recent Sunday evening (May 17, 2015 episode) on “60 Minutes”, the above new Smithsonian National Museum of African-American History & Culture (“NMAAHC”), in the shadow of the Washington Monument in Washington, DC, is now being completed. This is a monument to the “history & culture” of many previously-unknown citizens who have contributed greatly, but often without public recognition, to American progress and accomplishment. Many, many artifacts are ALREADY installed there for viewing starting next year (e.g., an historic railroad car was deposited by a special crane & rigging, during construction, as its place is on one of the subterranean levels which could not have been sufficiently accessed after the building was 100% done!). Go to the CBS website for more film on this! www.cbsnews.com/latest/60-minutes/full- episodes/. In part as a result of this NMAAHC signature project, we are now also working on other major AESS jobs. 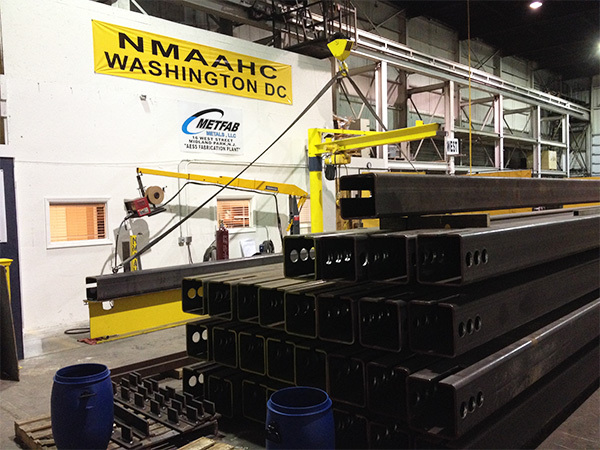 With the last shipment for NMAAHC now gone, we here at Metfab Metals freed up our Midland Park specialty shop for current AESS work. Hudson Yards (3), per a new customer, is fast filling our work quota there, but we can always “make room” for the new work you send. But, as we have told you in many past Newsletters, we are not exclusively a “big job” fabrication machine or simply an “AESS shop”. Our shops continue daily to turn out smaller day-to-day orders, light-gauge metal parts and “ordinary” fabricated metals of all types. 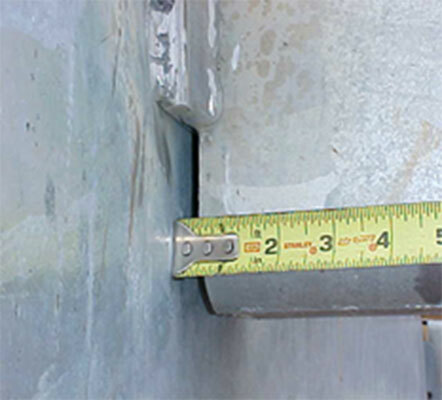 When you need specialty metal work—light or heavy gauge--or just rudimentary anchors, shims, frames, notched beams, flashings or whatever----call us. We’ll respond with the high-quality parts all our customers have come to expect now for decades. 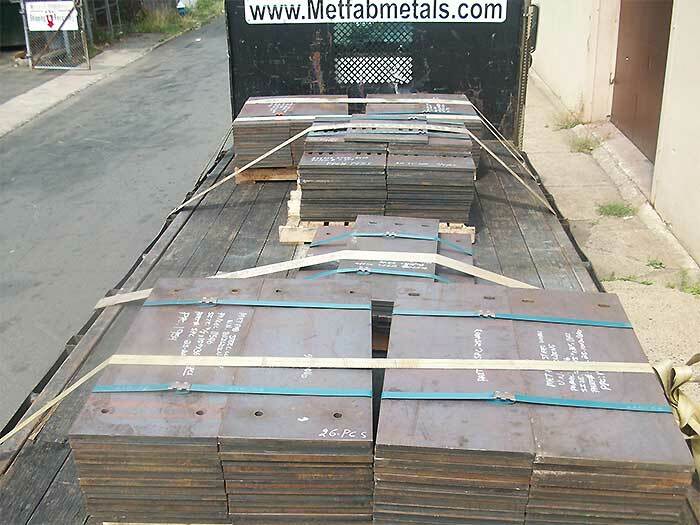 We ALWAYS deliver our Metfab Metals products and services in full compliance with your specs. That’s our commitment. That’s all. National Museum of African American History & Culture, Wash., DC (“NMAAHC”) -----100% done, delivered & erected at this magnificent building. We got past lots of “speed bumps” here, imposed strict Project Management, created unique strict-tolerance AESS integrated frames, & worked “hand in glove” with the erection group to get this new D.C. magnet job moved along. Hudson Yards, NYC, NY -----This is a real source of challenging fabrication issues, now and for the next few years! 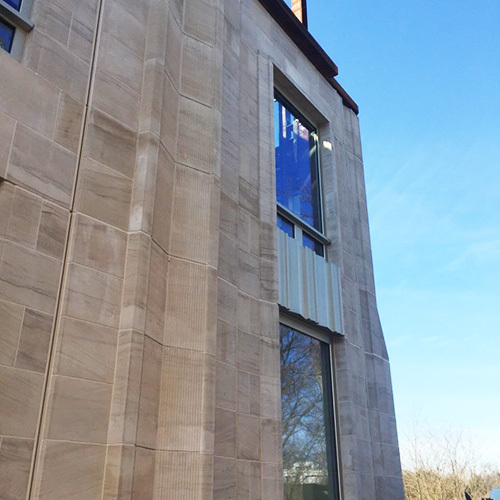 Not only is AESS work needed here, but other mundane parts such as anchors, clips, mullions, lintels, etc… We are first making finely-finished mullions for its first phase You can follow this work not only on our website, but on the project’s website at www.hudsonyardsnewyork. com. 635 57th Street high-rise ----The specs here require unique “twisted” frames to accommodate its pyramidal exterior look. In other words, the fabrication is essentially as if in four (4) dimensions! But it’s working and many of our frames are already installed---and fit this complex design. We always offer to work---FOR FREE---with our customers at the project concept stage to anticipate issues before fabrication, to suggest better ways to order, extrude, cut, drill, paint, finish, even stage and deliver and always to save time and money. Come in! Talk about pre-construction fabrication issues BEFORE they become delays! 1. 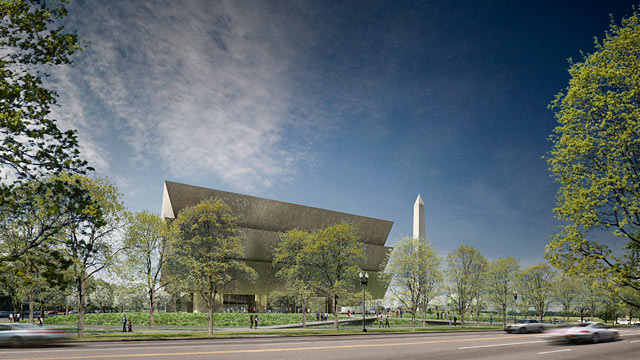 Look at this at www.nmaahc.com where a dynamic illustration shows this unique building in time-release construction and then de-construction. Another version of this building under construction can be found at http://nmaahc.si.edu/Building/Camera. 2. Though most of you are familiar with this term, AESS is the acronym for Architecturally Exposed Structural Steel----a catch-all phrase for any (large or small) finely-finished steel members (prepped, welded, filled, blasted, polished, and/or uniquely painted/finished) to be permanently open to the view and touch of all after the job is done. AESS work is never covered by sheetrock or otherwise hidden from public view. Our COO, Jim Murray, has been an integral part of many early AESS projects, such as the BWI International Airport [Now BWI Thurgood Marshall Airport] (erected about two decades ago and serving the Washington, DC/Baltimore area). There you can see the structural steel ceiling space frame with its threads, pipes and connections in plain view-------- and still shining like its original fabricated & installed condition! 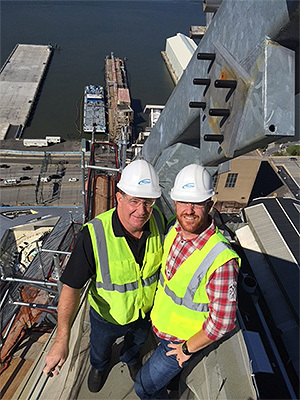 Since then, Jim has overseen AESS jobs as varied as the American Jewish Heritage Museum in Philadelphia and the unique roof ladder coverage of an interior courtyard at 51 Louisiana in Washington, DC and the Borgata Casino overhang in Atlantic City, NJ. WTC4 (at the restored Ground Zero in NYC) and VCU (Virginia Commonwealth University, School of Medicine) are even grander and more striking examples of our expertise in this evolving art form and architectural esthetics. Metfab Metals is proud to have been selected to do the AESS components on all of these jobs. 3. We are supplying this planned cluster of high-rises and other Hudson Yards development on the west side of Manhattan with the same type of huge pristine mullions we delivered to WTC4. Last month in our April, 2015 Newsletter, we reported a huge new high-rise to be built in Midtown Manhattan----220 Central Park South. This megalith is designed by the celebrated architect, Robert A. M. Stern, AIA as his newest incarnation----a literal hybrid of the best of old and new technologies. The building itself will have all the amenities of this new breed of luxury buildings now rising in NYC. [This is not without controversy as many long-term New Yorkers don’t accept that their park space and their views should be breached by these new spires. But that is not an issue for us to debate.] But it incorporates some fine “old” ideas. We here at Metfab Metals have successfully made our contribution oin the form of a model or PMU (1) to show the “220CPS” design team what the exterior of most floors of this building will look like. While building a PMU is no guarantee that our customer will give us the fabrication for the project itself, we strongly believe----from decades of experience---this gives our customer and the project’s design team a far better “feel” for large and small pitfalls that can delay progress during critical phases of the building. It also shows what we can do---and do well. We have on staff the experienced and certified fabricators, welders and finishers that can expedite a job like 220 Central Park South and deliver all the items in “install” condition with no need for field fixes to conform. Now what else can we do for you???? 1. PMU is the common trade acronym for “Performance MockUp”. 2. AESS is the now established acronym for Architecturally Exposed Structural Steel. See our Newsletters for 2014, now in our available archives at our website. Every so often, we like to go back and see what we have been doing for our customers (actually, our editor tracks and plans this protocol) and how we have improved our products, outsources and services. In our December, 2012 Newsletter (1), we even reported to you our growth in recent years. We feel this gives our newer customers a better “feel” of all we can do for their jobs and how we have developed expertise in various fields and in the production of the entire spectrum of our products. One very specialized field we have concentrated on in recent years (and in many Newsletters to you---look in our 2013-2014 Archives online) is AESS (2) steel. But we worry that stressing one product can cause you to lose sight of how much long-term experience we have in others that are regularly needed in your projects. This was just driven home to us when a familiar customer somewhat-tentatively asked us to quote the job illustrated below. 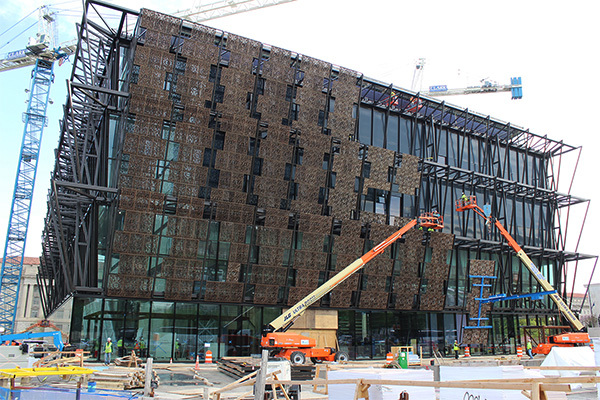 As we just completed our final deliveries for the Washington, DC National Museum of African American History & Culture (“NMAAHC”) with fabricated external frames to be formed after completion of erection into a web of architectural beauty. (4) Their website shows the daily progress, as if in time-release, of this into the final days of completed erection with installation of the novel history-tracing plaques. These fabrications were big challenges for us, but we filled every item we were asked by Project Specs----and our customer---and intend to do the same now at “220 CPS”. .
Now what else can we do for you???? -----------This is so whether you have a glass curtainwall or a stone one, or any other innovation your design team conjures. [See Glass Magazine, December, 2014, pgs 18-23 (National Glass Association @2014). 1. Go to our Newsletter archive for 2012 to see this original Newsletter. 2. AESS is the now established acronym for Architecturally Exposed Structural Steel. 3. See this more fully in our February, 2015 Newsletter. 4. Look at this at http://nmaahc.si.edu/Building/Camera where a dynamic illustration shows this unique building in time-release construction and then de-construction. We just completed our final deliveries for the external frames at the Washington, DC National Museum of African American History & Culture (“NMAAHC”). The above candid shot is not “PhotoShop’d” or a re-mastered illustration, but an actual view of one of the final days of erection. This was big, challenging job for us, but we filled every item we were asked by Project Specs----and our customer. Now what else can we do for you?-----------The contracting business, as with the manufacturing business, and all their constituent elements require follow-up ----and more follow-up. This, in turn, requires us to regularly review how we do things, how we formerly did them and how we might even better do them. We here at Metfab Metals have found that looking back provides a good way to measure whether---and how much---progress we have made toward 100% customer satisfaction. Of course, our 3rd party services (outsources) are a critical part of our total commitment to our customers. 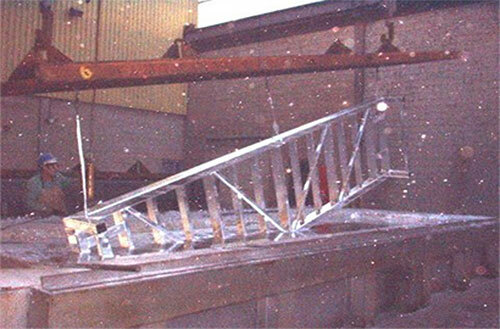 A major example of this is galvanizing which is a common finishing process often needed by our customers. But what is it really? Basically, as this illustration shows, this is a steel treatment or “dipping” process that applies a protective zinc coating to steel to retard rusting. The method most often employed is hot-dip galvanizing, in which steel parts are dipped into and “bathed” in molten zinc. The result protects the steel in two ways: (1) with a surface coating of corrosion-resistant zinc preventing most corrosive substances (e.g., oxidation in the form of rust) from damaging the metal parts themselves; (2) in case the coating is damaged, marred or scratched, the steel piece itself will still be protected by the remaining zinc underneath or in the surrounding area. 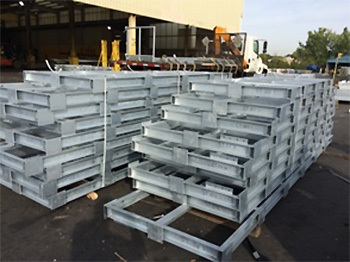 Beyond that, if the galvanized finish is damaged after it leaves our control (in the course of delivery, handling, installation or whatever) the galvanizing protection can be “repaired”, even at the jobsite. The accepted standard for such repairs is the one promulgated by ASTM International (the recognized authority in this field). (1) The goal is to replace the zinc coverage that has been removed or otherwise disturbed. There are three (3) types of materials that possess the characteristics needed to repair the protective zinc barrier on the steel: (a) zinc-based solders; (b) paints containing zinc dust; & (c) sprayed zinc. But always be mindful of the crucial importance of the way in which these products are applied AND the needed skill of the artisans doing the application! Preparation and treatment of the damaged area is key. So send us all your “specialty steel” work, especially if the spec requires Hot Dip Galvanizing. We not only get it done right, we retain only long-term experts in this science so we can give you compliance with all your specs and, if necessary, the on-site cures for minor damage, followed by the certifications your job specs more and more often require before your last invoice is paid. But what does this all mean to you, our customers, here at Metfab Metals? It means we know our industry and always adjust and learn so that we better handle our common marketplace and the metal products you need. We do this so that we can fulfill all your metals needs.We daily implement better methods, better processes, better subcontractors, better technology, and better records of how we did it all. 3. ASTM A780/780M-09, A2.1.2; A2.1.3; A2.1.4 &5. 5. The chemistry of “anodes” and “cathodes” is beyond the scope of this note, but we add a further brief explanation just to be complete here. We are happy to supply you with whatever literature you need to be certain you are adhering to all Job Specifications as to continuing galvanic protection. Last February, in our Newsletter, we talked about what was needed by a 21st century fabricator to do the work your ever-more sophisticated plans & specs call for. “Tools” was the first subject of course, though certainly not just manual tools. But, critically important to such demanding specs is also the “effort” your fabricator expends to make not just roughly spec-compliant parts, but “excellent” ones. We always make that effort for you. Now a year later, we have even more to tell you about us here at Metfab Metals-----and our “commitment to excellence”. Daily we work on world-class jobs-------and all the routine stuff too. But the good part is that we are doing all of it with focused commitment, better equipment, better personnel and better processes. Of course, for construction in 2015 steel is still indispensable; but uniquely fabricated steel seemingly becomes more indispensable also with every new job. As we wrote last February, it’s actually not the mundane hand and/or mechanical shop “tools” that are the first essential any longer. 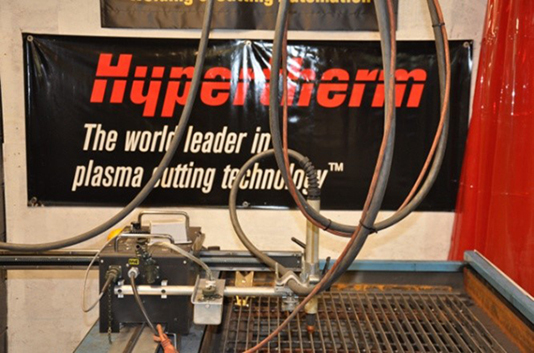 It’s the modern, computerized office & shop equipment (today’s primary “tools”) that are absolutely indispensable to executing fabrication jobs in 2015. Metfab Metals has these “tools----and more! And so much more on our server or in the “cloud”. In short, we are never satisfied with the mediocrity of an outdated status quo when better methods, technology and personnel are available. This is what has made our products superior to others. Now 15 years into the 21st century, we here at Metfab Metals are doing truly sophisticated AESS work starting with these “cyber-tools”. Also Metfab Metals employees know that the mediocrity of even the slightest discrepancy in the production process and/or variance from the fab drawings is unacceptable. This is the only way we can deliver exactly what your design team has drawn & spec’d. Then our ever-vigilant owner, Jim Murray, adds another layer to this attention to detail with his constant oversight. Nothing gets by this additional Metfab Metals ’ “QC”! If you haven’t tried us (ever or maybe just not recently), give us a shot as we will NOT disappoint you or fail to deliver as promised. every way from the design stage to the last delivery on all your jobs. Try us! 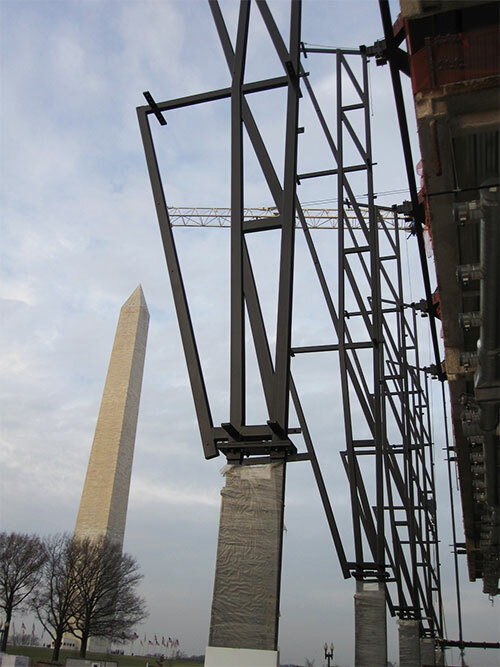 National Museum of African American History & Culture, Wash., DC (“NMAAHC”) -----As we post this, we are making the final deliveries of the last AESS exterior frame parts for this much-anticipated project. Throughout our work here Project Management and QC/QA were paramount. Take a look at this project status at www.nmaahc.com. 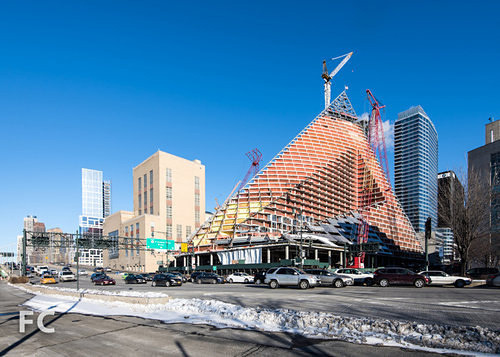 625 W.57th Street, NYC, NY-----Take a look back at our November, 2014 Newsletter if you have not seen this “urban pyramid”. We have already completed most of the sloping (curved & often twisted) steel parts. Now we’re into production of the more traditionally-designed frames and mullions. Follow this job with us as we work on it throughout 2015. Hudson Yards, NYC, NY-----Our team continues to work on the unique AESS mullions needed for the first building in this complex. We are ready to fabricate, finish and deliver these when construction reaches that stage. We have already delivered the same type of huge solid mullions to various jobs in the recent years, e.g., WTC4 in NYC, VCU Medical School in Richmond, VA and others. Measuring Device -See more below- Tape Measure: Old-fashioned "Accuracy Device"
Have you ever used a “laser tracker”, e.g., The Omnitrac 2? (2) This portable device has now been implemented in our shop to check the precision of our parts BEFORE they are shipped. More and more orders merit this kind of checking. Basically, what this neat little “laser tracker” (basically a laser device married to a computer) can do is: compare, by a pictorial overlay on our computer screen, the measurements prescribed by the approved drawings with the “field measurements” that this device takes in our shop & transmits electronically so that one is super-imposed over the other. Then---voila’---you can see any variances and make adjustments, all before shipment, right on our shop floor. And this is all done by a totally portable (though expensive) device and a roller-bug that traces over the edges of the finished item to check it for conformance, variations and tolerances. As you watch the red laser beam trace over the part, its path is reflected electronically by wi-fi on the computer screen leading to a printout of actual dimensions and a drawing to reflect that. This, in summary, immediately shows us how accurately we made, welded and assembled the parts designed and set out in the fab drawings. 1/8” to 1”; 1/8” to Unl. 1/8” to 3/4”; 1/8” to Unl. So send us your specialty “weld-work”. We not only do it right, we can give you the certifications your job specs more and more often require. But what does this mean to you, our customers here at Metfab Metals? It means we have learned and understood our marketplace and our industry and updated to meet your identified needs. So much so that we can fulfill all your fabrication needs.We have learned and implemented better methods, better “measuring”, better technology, better welding, all to make precision parts----and then better records & certifications of how we did it all. What has become our keystone in all of this?----PRECISION. This precision is from the getgo: from the details in our quotes, to our review of the pre-engineered drawings, to our shop (“fab”) drawings, to our foreman’s layouts, to our measurements, cuts & assembly, to our welds, to our finishes, to our loading, packing & deliveries as ordered! condition, as designed, accurately made as spec’d. 2. As described by its manufacturer, Automated Precision, Inc. (“API”), “The Omnitrac 2 is the ideal measuring instrument for a wide variety of applications in industry……”including fabricated parts, especially large ones. The Omnitrac 2 “is the only wireless laser tracker capable of dynamic measurements.” The Omnitrac 2 “uses ADM (Absolute Distance Measurement) technology to operate. 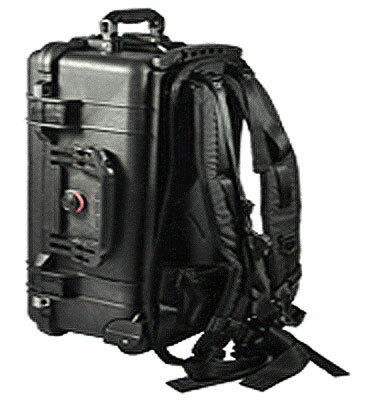 It can be mounted and used in any position: overhead, perpendicular to a wall or inclined in space, beneath or inside a part.” The Omnitrac 2 “transmits data via WiFi.” Full data on this useful modern tool is available at API’s website, www.apisensor.com. 3. All 'Codes' are “AWS” (American Welding Society).